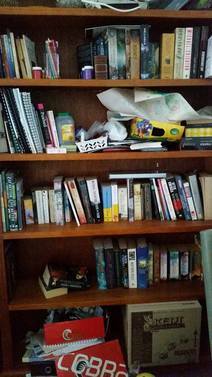 A "shelfie" is a picture of one of your personal bookshelves. That's one of mine above, which is full of Penguin classics, Terry Pratchett novels, the Harry Potter series, cook books (in disarray because the kids can reach them and like to look at the pictures) and some other random objects like a fairy wand and a leaf my daughter stuck there with blu tack for mysterious kid reasons. 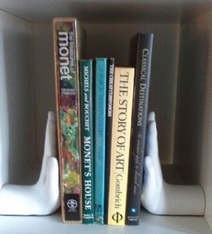 Are you game to share a shelfie of your own? I was only able to get half of the book case, but there are more believe me. A few years ago I have masses of books, then had to move so the books had to go! Very sad to be honest.I spent a lot of money. Haha I would love to but I fear mine is too cluttered to be presented to the public! Clutter is fine too. I say that, but I deliberately took a picture of my least cluttered bookcase. Here's mine! This is one bookcase in my study. It has some books, paints and craft stuff up high where the children can't reach, a box of books that I haven't unpacked yet, and a few "bits and pieces". I live for the day that the fairies come in and unpack all my boxes of books and organise my shelves and put up a barrier so that the children can't attack my shelves! Kids certainly add a couple of levels of difficulty to unpacking. I have two large bookcases full of books but this shelf is my favourite. The bookends were a gift from my son. I love them. Those are very cool bookends. Top of book shelf, bottom is a mess!! Had a Library in my original house, full of the most beautiful books I could buy on my interested subjects. It was the epitome of learning & tidiness. All laid in Alphabetical subject matter & within that subject as well. Could just put my hand to book anything for reading or reference. There were 100's of them, all dearly loved. Then I had to move. I cry when I think that now all my 'beauties' are locked up in moving cartons, probably never to see light of day again, as current house is basic beyond words. Not only does it have no cupboards, it has no shelves! And no room for even a small bookcase. Very depressing.